Polbase - Reference: Structure of the theta subunit of Escherichia coli DNA polymerase III in complex with the epsilon subunit. Structure of the theta subunit of Escherichia coli DNA polymerase III in complex with the epsilon subunit. The catalytic core of Escherichia coli DNA polymerase III contains three tightly associated subunits, the alpha, epsilon, and theta subunits. The theta subunit is the smallest and least understood subunit. The three-dimensional structure of theta in a complex with the unlabeled N-terminal domain of the epsilon subunit, epsilon186, was determined by multidimensional nuclear magnetic resonance spectroscopy. The structure was refined using pseudocontact shifts that resulted from inserting a lanthanide ion (Dy3+, Er3+, or Ho3+) at the active site of epsilon186. The structure determination revealed a three-helix bundle fold that is similar to the solution structures of theta in a methanol-water buffer and of the bacteriophage P1 homolog, HOT, in aqueous buffer. Conserved nuclear Overhauser enhancement (NOE) patterns obtained for free and complexed theta show that most of the structure changes little upon complex formation. Discrepancies with respect to a previously published structure of free theta (Keniry et al., Protein Sci. 9:721-733, 2000) were attributed to errors in the latter structure. The present structure satisfies the pseudocontact shifts better than either the structure of theta in methanol-water buffer or the structure of HOT. satisfies these shifts. 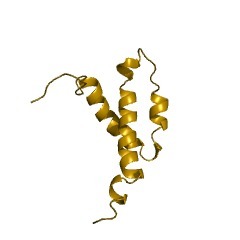 The epitope of epsilon186 on theta was mapped by NOE difference spectroscopy and was found to involve helix 1 and the C-terminal part of helix 3. The pseudocontact shifts indicated that the helices of theta are located about 15 A or farther from the lanthanide ion in the active site of epsilon186, in agreement with the extensive biochemical data for the theta-epsilon system.